Over $30,000 profits, trading in a laid-back manner because this trade took me a total of 30 minutes to spot the trade, to get into the trade, to monitor it for almost 2 years (I used 10 sec just to check the price level once every month). And it’s safe because I have already automated my exits so that even if it goes against me, I will still be in profits. 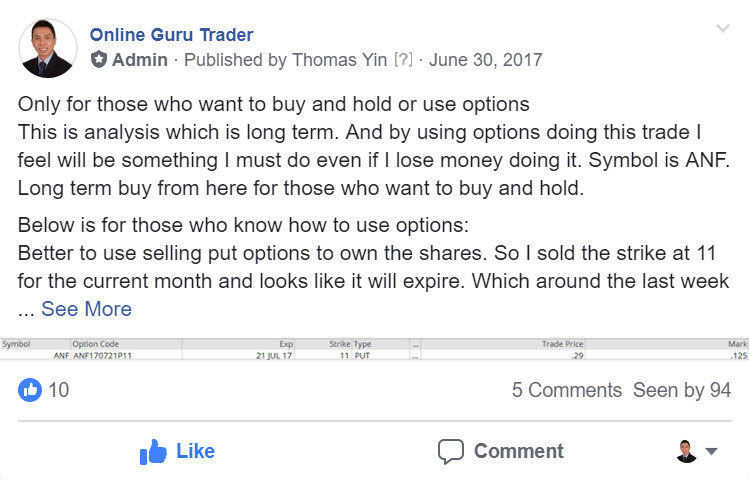 Finally found the post (see attached screenshot) about this long term buy and hold trade on ANF (which I mentioned earlier in this page) which was posted in June 2017 in my private member’s group. With the combination of options and stock, I was able to more than doubled my investment. Getting about 1%-3% return per month with options for almost 2 years and that’s about 11% to 36% return on capital in a year. Plus another price appreciation of the stock from $11 (price I bought) to now above $26 (current price level). A more than $15 profit per share. All in all, for this long term trade, I think it’s safe to say that it is well over $30,000 in profit. Before you do that and go all out on that, I just want to say you are missing the big picture. Because you are not going to be successful in options or stocks or even forex if you are missing this big picture. You see, it’s not about using options, not even about the stock or even forex. They are just tools, instruments, vehicles. Instead of focusing on those things, focus on the process of getting winning trades. Because if you know the process of getting winning trades, you will be profitable using it in options, stocks, or even forex. If you do not know the process of getting winning trades, you will not be profitable using it on options, stocks, or even forex. So the big picture here is to focus on learning the process of getting winning trades.